Profiles of Joseph L. Tomao & Theodora Marangas, attorneys at law in Garden City, Nassau County, New York. At Tomao and Marangas, we pride ourselves on providing professional and personalized legal services to all of our clients. Our firm specializes in real estate insurance coverage issues, personal injury, medical/dental malpractice and probate law. Tomao and Marangas attorneys and paralegals are only available to provide legal services to individuals and businesses. 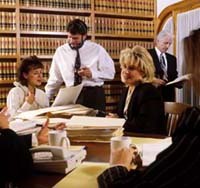 Tomao and Marangas is staffed only by lawyers and paralegals who specialize in the legal services provided by our firm. Tomao and Marangas has over 25 years of experience, and has successfully resolved hundreds of cases. Tomao and Marangas has recovered millions of dollars in compensations for its injured clients. Next time you need to retain legal counsel, think of Tomao and Marangas. We guarantee that you will be happy with your choice. Copyright ©2000 - 2011, Tomao & Marangas. All rights reserved.